Bruce Ledewitz. 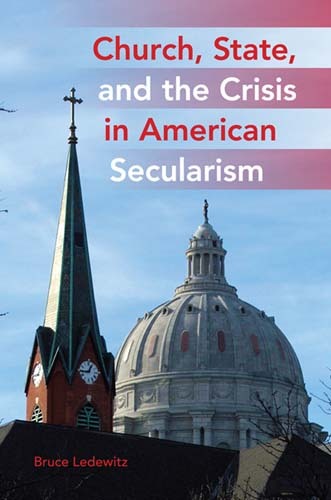 Church, state, and the crisis in American secularism. Indiana University Press, c2011. Since 1947, the Supreme Court has promised government neutrality toward religion, but the public square is anything but neutral. This book seeks common ground for believers and nonbelievers regarding the law of church and state. The author argues that allowing government to promote higher law values through the use of religious imagery would resolve the current impasse in the interpretation of the Establishment Clause. It would offer secularism an escape from its current tendency toward relativism in its dismissal of all that religion represents and encourage a deepening of the expression of meaning in the public square without compromising secular conceptions of government. Ruben Zaiotti. 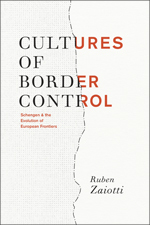 Cultures of border control : Schengen and the evolution of European frontiers. University of Chicago Press, c2011. In recent years, a number of European countries abolished national border controls in favor of Europe’s external frontiers. In doing so, they challenged long-established conceptions of sovereignty, territoriality, and security in world affairs. In this book, the author traces the transformation of underlying assumptions and cultural practices guiding European policymakers and postnational Europe. The book also includes a fascinating comparison to developments in North America, where the United States has pursued more restrictive border control strategies since 9/11. Managing the risk of fraud and misconduct : meeting the challenges of a global, regulated, and digital environment / edited by Richard H. Girgenti, Timothy P. Hedley. McGraw-Hill, c2011. Prashant Dubey, Sam Panarella. Litigation readiness : a practical approach to electronic discovery. Oxford University Press, c2011. Nathan Andrew Preuss. Habeas corpus : a legal research guide. William S. Hein & Co., Inc., 2011. Mark A. Hall, Ira Mark Ellman, David Orentlicher. Health care law and ethics in a nutshell. 3rd ed. West, c2011. The transformation of international environmental law / edited by Yann Kerbrat, Sandrine Maljean-Dubois. Hart Publishing, 2011. Jeffrey L. Harrison. Law and economics in a nutshell. 5th ed. West, c2011. Compensation plans for law firms / edited by James D. Cotterman. 5th ed. ABA, Law Practice Management Section, c2010. Russell L. Weaver, Elaine W. Shoben, Michael B. Kelly. Principles of remedies law. 2nd ed. West, c2011. Stafford Act reform : sharper tools for a smarter recovery : hearing before the Ad Hoc Subcommittee on Disaster Recovery of the Committee on Homeland Security and Governmental Affairs, United States Senate, One Hundred Eleventh Congress, second session, May 12, 2010. Deluge of oil highlights research and technology needs for effective cleanup of oil spills : hearing before the Subcommittee on Energy and Environment, Committee on Science and Technology, House of Representatives, One Hundred Eleventh Congress, second session, June 9, 2010. Social security disability fraud : case studies in federal employees and commercial driver's licenses : hearing before the Permanent Subcommittee on Investigations of the Committee on Homeland Security and Governmental Affairs, United States Senate, One Hundred Eleventh Congress, second session, August 4, 2010. The Second Chance Act : strengthening safe and effective community reentry : hearing before the Committee on the Judiciary, United States Senate, One Hundred Eleventh Congress, second session, July 21, 2010. Proposed combination of Comcast and NBC-Universal : field hearing before the Committee on the Judiciary, House of Representatives, One Hundred Eleventh Congress, second session, June 7, 2010. United States Department of Justice : hearing before the Committee on the Judiciary, House of Representatives, One Hundred Eleventh Congress, second session, May 13, 2010. Offshore aquaculture : hearing before the Subcommittee on National Ocean Policy Study of the Committee on Commerce, Science, and Transportation, United States Senate, One Hundred Ninth Congress, second session, April 6, 2006. Nominations of Hon. Ernest W. DuBester, Julia Akins Clark, and Rafael Borras : hearing before the Committee on Homeland Security and Governmental Affairs, United States Senate, of the One Hundred Eleventh Congress, first session : nominations of Hon. Ernest W. DuBester to be a member, Federal Labor Relations Authority, Julia Akins Clark to be general counsel, Federal Labor Relations Authority, and Rafael Borras to be under secretary for management, Department of Homeland Security, July 29, 2009. Jobs, jobs, jobs : transforming federal hiring : hearing before the Subcommittee on Federal Workforce, Postal Service, and the District of Columbia of the Committee on Oversight and Government Reform, House of Representatives, One Hundred Eleventh Congress, second session, May 19, 2010. Competition in the evolving digital marketplace : hearing before the Subcommittee on Courts and Competition Policy of the Committee on the Judiciary, House of Representatives, One Hundred Eleventh Congress, second session, September 16, 2010. Camp Lejeune : contamination and compensation, looking back, moving forward : hearing before the Subcommittee on Investigations and Oversight, Committee on Science and Technology, House of Representatives, One Hundred Eleventh Congress, second session, September 16, 2010. Antitrust laws and their effects on healthcare providers, insurers and patients : hearing before the Subcommittee on Courts and Competition Policy of the Committee on the Judiciary, House of Representatives, One Hundred Eleventh Congress, second session, December 1, 2010. Afghanistan and Pakistan : oversight of a new interagency strategy : joint hearing before the Committee on Oversight and Government Reform and the Subcommittee on National Security and Foreign Affairs of the Committee on Oversight and Government Reform, House of Representatives, One Hundred Eleventh Congress, first session, June 24, 2009. Workforce issues in health care reform : assessing the present and preparing for the future : hearing before the Committee on Finance, United States Senate, One Hundred Eleventh Congress, first session, March 12, 2009. Nomination of Kathleen G. Sebelius : hearing before the Committee on Finance, United States Senate, One Hundred Eleventh Congress, first session, on the nomination of Kathleen G. Sebelius to be Secretary of Health and Human Services, April 2, 2009. Nominations of Hon. Tara J. O'Toole and Jeffrey D. Zients : hearing before the Committee on Homeland Security and Governmental Affairs, United States Senate, of the One Hundred Eleventh Congress, first session : nominations of Hon. Tara J. O'Toole to be under secretary for science and technology, U. S. Department of Homeland Security, and Jeffrey D. Zients to be deputy director for management, Office of Management and Budget, June 10, 2009. Faith-based initiatives : recommendations of the President's Advisory Council on faith-based and community partnerships and other current issues : hearing before the Subcommittee on the Constitution, Civil Rights, and Civil Liberties of the Committee on the Judiciary, House of Representatives, One Hundred Eleventh Congress, second session, November 18, 2010. Foreclosed justice : causes and effects of the foreclosure crisis (part I & II) : hearing before the Committee on the Judiciary, House of Representatives, One Hundred Eleventh Congress, second session, December 2, 2010 and December 15, 2010. Evaluating the Justice Against Sponsors of Terrorism Act, S. 2930 : hearing before the Subcommittee on Crime and Drugs of the Committee on the Judiciary, United States Senate, One Hundred Eleventh Congress, second session, July 14, 2010.